I have been hosting brunches and inviting Dallas bloggers to join me for almost two years now! In that time, we have eaten at some phenomenal Dallas restaurants (see past brunches from The Rustic, Saint Ann, Mercat Bistro, and Nordstrom's Bazille)! Last week we dined at Lark on the Park, overlooking Klyde Warren Park in downtown Dallas, and it was one of my favorite brunches to-date. The combination of service, food, and a private dining experience provided the foundation for networking and relationship building that led to intimate conversations with acquaintances new and old. Florals were provided by Megan of Celebrate Dallas and were fall perfection! Megan is so creative in her floral design and also hosts floral workshops! 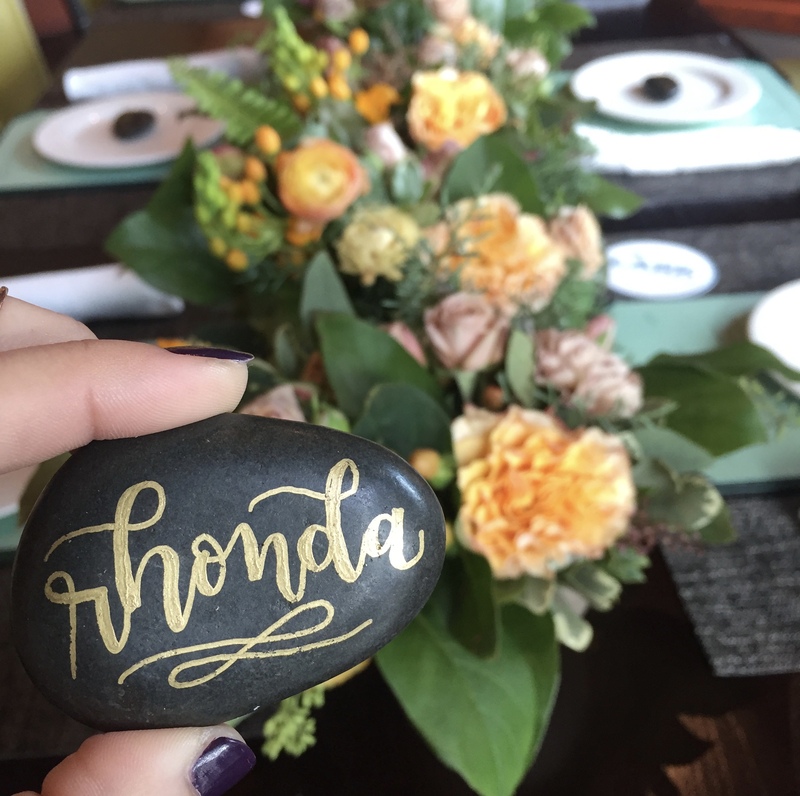 Calligraphy and place cards were provided by Amanda of Renewed Calligraphy; these stones were the perfect place card for Lark on the Park. I am constantly amazing by the talented women who add their special touch to bring Dallas Blogger Brunch to life each month! Lark on the Park featured a seasonal Blackberry & Thyme Mimosa that was a delicious departure from the traditional brunch cocktail. As we mingled and started to take our seats, we enjoyed a pasty board and looked over the menu that features brunch favorites as well as vegetarian options and health-conscious dishes. If you like pear butter (and carbs! ), you have to order the pastry board to try these treats for yourself. I can't wait to go back to Lark on the Park soon! The Lark Benedict, pictured above, is what Melissa ordered and she said it was the best benedict dish she had ever eaten! I, of course, did not opt for a healthy choice, and enjoyed the Cornbread French Toast with roasted peaches, ginger-vanilla syrup, maple cream, and pecans! Yum! It was worth it and I highly recommend it. The bloggers who attend brunch were also responsible for creating a comfortable and open atmosphere at brunch. These ladies were wonderful guests and I look forward to continuing to grow our friendships as we support each other in the blogosphere. Top Row (L to R): Amanda, Kami, Kelsie & Lexi, Melissa, and Dale. Bottom Row (L to R): Courtney, Anna, and me. Thank you to Lark on the Park for allowing Dallas Blogger Brunch to dine with you! Professional photos by Champagne & City Lights.